Crillio Trio, so what gives about a Crillio Cigar? So recently I was perusing a catalog for an on-line retailer and noticed a sampler pack for a Crillio cigars. I knew I had smoked some with the title but wasn’t exactly sure what it meant. A quick Google search revealed that it was a type of tobacco leaf originally used in Cuba, surprise, and has evolved into a mold resistant leaf. You can find some good information on-line about the leaf but the important thing is it delivers a slightly different flavor than other leafs. So being intrigued, I bought a sampler, the sampler had two of each of the above cigars so I smoked the first set after letting them sit in the humidor for a couple of weeks. This told me enough, taste wise, that I do like this leaf and combination of fillers that each manufacturer had used though two of them are better than the other. I have smoked Tempus before and noted somewhere that I really enjoyed it. 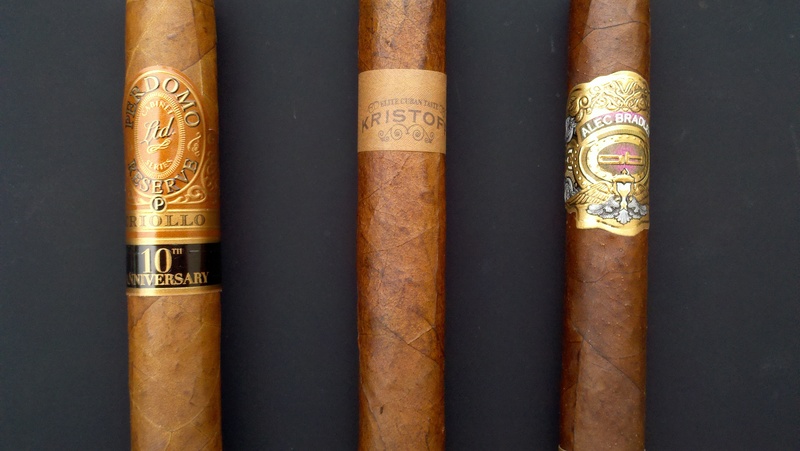 The Kristoff cigar I had discovered a couple of years ago and really enjoyed their product and presentation so I was excited about trying their crillio cigar. As far as Perdomo, I have had some that I liked and some that i wasn’t so crazy about, that holds true in this selection. The Kristoff was excellent, though I don’t have any notes jotted down about it, i do remember it being a smooth, tasty cigar that I thoroughly enjoyed, which has been most of my experience with Kristoff cigars. The Tempus I smoked while backstage at a concert with my oldest friend Shawn Mullins after he opened for Judy Collins at Wolftrap Amphitheater in Vienna, VA. Being I do not get to see Shawn often these days it was a special time and for me and the Tempus delivered. And then, the Perdomo….. The Perdomo starts with a wonderful spice right off the light, then mellows, and then somewhere near the middle, gets, nasty…. well, not entirely nasty but not agreeable to my taste. Then, after your trying to figure out, what the hell does it mean, it mellows out and becomes a very enjoyable smoke. Confused, me too! But it happened with both cigars which leads me to wonder what happened. Was it a transition of leafs? I have no idea, and hopefully one day I will understand what it all means. So as far as recommending, I would unhesitatingly recommend the Kristoff and Alec Bradley Tempus, but be aware of the Perdomo as having a “spot” of confusion. Maybe a different sized such as a Toro or Churchill would have a better result? Not sure if I will spend my dollars to figure it out. And as a side, these are cigars I could recommend having a dram of scotch with. They are not overpowering and as long as you are sipping a highland, speyside, or lighter scotch you should be fine. I would be careful around a peaty scotch because I think the taste of the cigar would not overcome the peat.